Ever so often, it's time to update a classic. Think of the winning rose Sun Flare…on steroids. Like its distant ancestor, this is a bloomin' fool of a rose with great clusters of flowers on a rounded bushy plant. 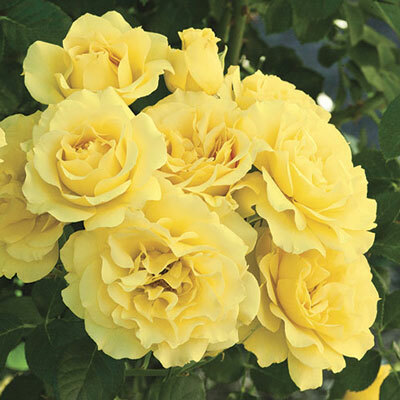 However, the improved update notches it up with brighter, longer-lasting yellow color, bigger flowers, glossier foliage, handsome dark red new growth & vastly improved disease resistance. Turn up the yellow & put some garden 'bling' in your landscape. Great as an easy care flowerful hedge. Available budded & own-root.